Last week at a nutrition program we made a batch of Peach-Carrot Smoothies for samples. I know most people don’t usually add carrots to their smoothies but this recipe is popular. Not only is it tasty (you don’t really taste the carrots) but it is also a healthy option since the main ingredients are fruit and vegetables. Recipe for Peach-Carrot Smoothie (youth and adult tested and approved!) from FoodHero.com: Combine the following ingredients in a blender or food processor: one medium banana (peeled), one cup canned carrots (drained and rinsed) and one 15 oz. can peaches, undrained. Add all the ingredients, including the juice from the can of peaches. Blend for a smoothie. We made two batches of the Peach-Carrot smoothie and by the end of the program, we had some left over. We poured the rest of the smoothie into push-up popsicle molds and put them in the freezer. These molds happen to be silicone but there are many different kinds of popsicle molds at the stores. Many of the molds are reusable but there are also some disposable ones available like the plastic tube bags. This article will suggest some healthy ingredients for making homemade popsicles. If you don’t have any molds specific to popsicles, do you have any mini muffin pans or small paper cups or ice cube trays? Any of these different containers can be filled with the healthy recipe and then covered with plastic wrap. The handle or stick can be popsicle sticks, a paper straw cut in half or an appetizer toothpick. Make sure to keep the added liquid a little below the top of the container because it will expand and therefore rise higher when it freezes. As mentioned above, if you have a favorite smoothie recipe, you can add it to a popsicle mold and freeze it into a summer treat. The following popsicle recipes will highlight some of the food groups that can be featured in your frozen treats. Focus on the fruit group. While many (but not all) purchased popsicles are named after fruit flavors such as cherry, orange or grape, often the main ingredient is sugar and added fruit flavors. Homemade popsicles are a good way to start with fruit or 100 percent fruit juice as the main ingredient. 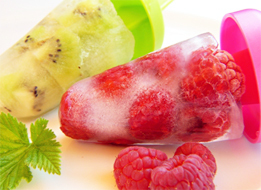 It can be as simple as adding some sliced or chopped fruit to the popsicle and using 100 percent juice as the liquid. Try this two-ingredient combination recipe for Grape Refresher Popsicles from the minituremoose.com: Slice or chop two cups of seedless grapes and add the grapes to the molds or cups. After filling with grapes, add 100% grape juice to the popsicle mold, add the stick and then freeze. This recipe will use approximately the same amount of grapes and grape juice (2 cups) although the exact amount will be dependent on the size of molds or cups that you use. Add more vegetables to your day. As shared before, carrots can be added to smoothies and another type of vegetable that is often added to smoothies is leafy greens like spinach or kale. This is a great way to add more vegetables to the day. The following recipe is from Kids Activity Blog. If you like things sour, you can double the lime. This recipe is for Lime Green Popsicles. Blend the following ingredients until smooth and then fill the popsicle molds: juice from one lime (approximately two tablespoons lime juice), one cup chopped fresh spinach, one banana, one green apple (diced) and one cup of apple juice. Add the stick and freeze. Add dairy for added calcium. This is an easy two ingredient recipe that features fruit and yogurt. The Strawberry Yogurt Pops recipe is from What’s Cooking, USDA online recipes. You will need one cup of low-fat strawberry yogurt and six large strawberries. Cut the strawberries into small pieces and mix them with the yogurt. Divide it up into ice cube containers or four small paper cups. Add sticks and freeze. This last recipe is also from What’s Cooking. If you want to skip the popsicle mold, try this cold Easiest Banana Ice Cream recipe. You will need two=to-three bananas that are very ripe, three tablespoons of milk and optional chocolate syrup to add to the top. Enjoy these healthy recipes as you keep cool this month!